Special Containment Procedures: Due to the nature of SCP-3653, containment is an annual event, occurring on the first of each year. When new instances of SCP-3653 are discovered, the instances are to be confiscated and incinerated.1 Any persons of clearance level 3 and below known to have seen SCP-3653 directly during January 1st are to be informed that a year only has 365 days. No further action is necessary. It should be noted that this must be a person-to-person explanation. Reading a written passage (including this article) declaring the amount of days in a year to be 365 is not sufficient to override the belief. Listening to a recording is not sufficient either. Under no circumstance are any personnel to inform any higher-ranking staff (such as Level 4s who have opted out, or any O5) that a year has 365 days. Doing so shall be punished by immediate termination of employment or life. As the SCP only affects Foundation personnel, and as its effect is very easily dispelled, it is considered contained. One instance of SCP-3653 is to be kept in a safe at Site-19 for testing purposes, and replaced each year. Description: SCP-3653 is a single-sheet calendar with 162 extra days, for a total of 527 or 528 days (dependent upon whether it is a leap year). The calendar has a Foundation logo on its upper left side, and the current year on its upper right side. The calendar is identical to the official Foundation Office Calendar, apart from the extra days. The calendar is printed in landscape orientation on thick-stock 8.5" by 11" paper. Each year, on January 1st at midnight, it will manifest in █████ homes or dormitories of Foundation members globally, according to the timezone each home is located within. Due to experimentation involving C-Class personnel (and associated records) it has been determined that instances likely originate from one of the extra days close to the end of the previous year, and are distributed by the Foundation itself. When SCP-3653 manifests, those it comes into contact with during January 1st will in fact experience a 527/528 day year. Additionally, subjects will not fall out of sync with those who have not seen the calendar. Explaining to the subject that a year has only 365 days will cause the subject to snap back to normalcy and retain no direct memory of the fifth and sixth weeks of each month. The calendar is otherwise non-anomalous, and will cause no effect if viewed after January 1st of the year. Experiment 1: Determine primary effect of SCP. Procedure: Class C-592 is intentionally allowed to keep her instance of SCP-3653 and is also allowed to return to her normal routine for one year. Result: At the end of the year, C-592 expressed confusion when provided with a 365-day calendar. She requested that her journal be retrieved and pointed out that the researchers involved with this experiment had in fact spoken with her on several of the non-existent days. The researchers had no memory of doing so. Subject was formally informed that a year only has 365 days, and allowed to return to her normal routine. Instance of SCP-3653 incinerated. Experiment 2: Determine whether the extra days are imagined or experienced. Procedure: Class C-625 is intentionally allowed to keep his instance of SCP-3653, and is instructed to have written conversations with researcher Dr. Green in his journal on the "non-existent" days. (To avoid prematurely confusing C-625, he was simply instructed to gather notes in the fifth and sixth weeks of each month). Result: At the end of the year, C-625 handed in his journal, despite confusion stemming from his insistence that there were still two weeks left before the end of the year. The subject was informed that a year only has 365 days. The subject then returned to his normal routine. Instance of SCP-3653 incinerated. The following is transcribed from the journal. Dr. Green: Please state today's date. C-625: Today is January 36th, 20██. Why are we doing this? Dr. Green: This is an exercise to determine whether information from the fifth and sixth weeks of each month can be preserved into the first day of the month afterward. C-625: O.K. What SCP are we testing? Is this journal the SCP? Dr. Green: If I explained to you what the SCP was, it would lose its effect. Dr. Green: At this point, C-625 cursed and demanded I tell him "what the big deal is". Please ensure that you've written down your response, instead of merely saying it. C-625: Can we be done for today? Dr. Green: Please write down your birthday, and then we can conclude the session. Above cover entry is not to be altered without O5 approval. Special Containment Procedures: Due to its nature, SCP-3653 cannot be conventionally contained. Four times per year, 1200 D-class personnel scheduled for termination are to be selected, launched into space aboard a standard Foundation cruiser, and accelerated to at least 0.9999c3. Description: SCP-3653 is a hostile 4th-dimensional entity which partially consumes the ability of sapient beings to experience time. The portion of experienced time consumed by the entity has been steadily increasing for as long as records exist. Methods for reversing the damage done by SCP-3653 are unknown, though research is ongoing. Methods to destroy SCP-3653 are unknown, though research is ongoing. This constant rate of consumption allows for astronomical measurements and seasonal changes to remain in sync with the 365 day calendar, for those who are not inoculated. The removal of roughly two weeks from the end of each month is an artifact of the way time is measured, and does not reflect actual "missing weeks." 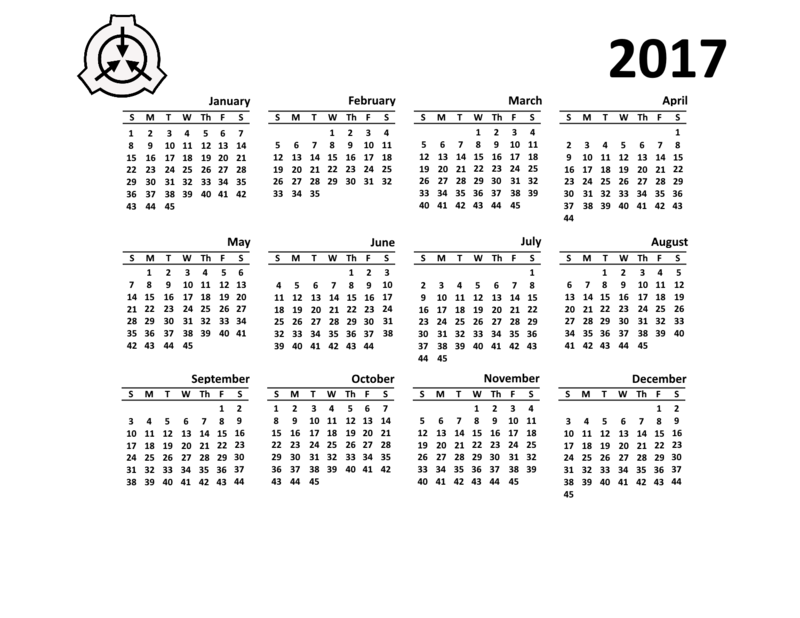 The calendar described in the cover entry, hereby SCP-3653-1, creates a mnestic effect for the person observing it, if observation happens on January 1st. This effect prevents SCP-3653 from consuming any of the person's experienced time, and allows the viewer to experience the full 527-day year. 38,275 copies of SCP-3653-1 are printed and distributed each year on December 44 by The Foundation, in order to ensure that some amount of people each year remain aware of the threat posed by SCP-3653. Informing the affected person that there are only 365 days in a year will cancel out the effect of SCP-3653-1 and render the person susceptible to SCP-3653. Any person who is not under the protection of SCP-3653-1 will still experience the "extra time", however they will retain no memory of doing so, as the experimentation in the cover entry suggests. It is for this reason that mentioning the amount of days in each year to an O5 is strictly forbidden, as O5s follow the 527-day calendar by default. It is regretful that the cover entry prescribes the incineration of most of the copies, and that many of the L4 researchers voluntarily dispose of their copies. However, nothing can be done about this. Allowing the true nature of SCP-3653 to become common knowledge may lead to panic among the staff. Allowing more people to be protected by SCP-3653-1 increases the risk of them giving dangerous and inimical SCPs more time by extension. Additionally, if we allowed knowledge of this issue to become widespread, there is a chance that more people would request protection from the entity. If we shield too many people from it, even slightly more than are shielded today, it may notice our feeble barrier and directly attack it. We do not believe it would stand up to such an assault. It is the opinion of the majority of the O5 council that the incineration passage lends credibility to the non-restricted containment procedures. We consider this an acceptable loss. 1. Researchers holding level 4 clearance or higher may keep their instances at their discretion. 2. However, Dr. Green did mention that he thought he'd had a dream where several of the conversations written in the journal took place. 3. "c" refers to the speed of light.